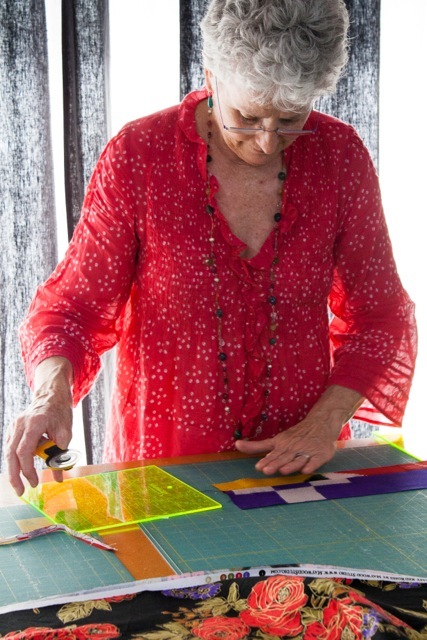 Learn to make quilts for lifelong enjoyment at Quilting Matters quiltmaking classes, situated at Lesmurdie in the artisan hills of Perth, WA, Western Australia. "Thanks again for all your help and extraordinary eye. Looking forward to doing more classes with you!" After ten fabulous years of teaching contemporary quiltmaking in the Perth Hills of Western Australia, I’m really looking forward to sharing with students in southern Tasmania. I’m constantly expanding my own skills and gathering fresh, inspiring material to share with students. Teaching others and enabling them to create beautiful work gives me enormous satisfaction. I use my ‘class sample quilts’ to simply ‘sew the seed’ and demonstrate what is possible. I encourage students to discover their own creativity, to develop their own style and to make individual pieces as their confidence grows. SALVAGE/SELVEDGE EXHIBITION 2014 was held at the Moores Building Contemporary Art Gallery in Fremantle WA where a large selection of beautiful, functional quilts and themed textiles were exhibited over two weeks in May/June 2014. A fundraiser for the School of St Yared in Ethiopia. ‘A BEX AND A GOOD LIE DOWN’ Log Cabin design using cotton retro floral print/ticking, machine quilted. Made for Salvage Selvedge Exhibition 2014. Sold at silent auction. ‘DESERT SKY’ Strippy design, vintage Japanese kimonos, machine quilted. Made for Salvage Selvedge Exhibition 2014. Sold at silent auction. ‘WELCOME IN’ Log Cabin design using vintage Japanese kimonos/silk linings, machine quilted. Made for Salvage Selvedge Exhibition 2014. Sold at live auction. OUT OF HAND EXHIBITION 2017 was held at Long Gallery Salamanca Arts Centre in Hobart by Stitching and Beyond, Tasmania – a diverse collective of textile and fibre artists. ‘ON A NEW ORBIT’ Log Cabin design, hand-dyed, recycled woollen blanket/silk. Made for Out of Hand Exhibition 2017. ‘MEMORIES’ One Block Wonder, quilt-as-you-go design using my late-Mum’s woollen knits, overlocked hexagon shapes, machine pieced. Made for Out of Hand Exhibition 2017.